Face Value: It could be a lot worse. There’s a truly lovely element to this cover – the blue is striking against the black and white image. 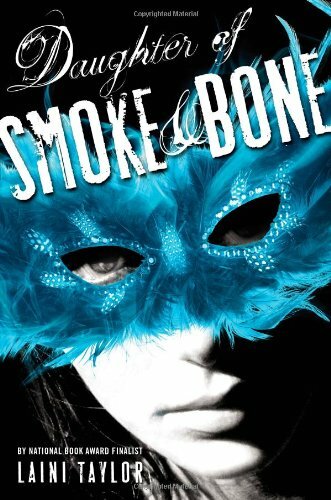 But the girl of the cover doesn’t exactly scream “Karou” to me either. I do love the way the back of the book looks though, with the wisps of blue feathers framing the quote. The shade of blue is just the color I imagine Karou’s hair to be. Does it Break the Slate? YES DEFINITELY! Karou is a fantastic character, and a Slatebreaker all the way through. Her unusual upbringing has left her not only physically fierce, able to take on almost anyone in a fight, but incredibly creative and deeply loyal. She also has a terrific sense of humor – I love when she describes her realization that the easiest way to avoid lying about her unusual family and numerous magical secrets is to tell the truth, “with a certain wry smile, as if she were being absurd. Over the years she’d found it was all it took, that wry smile, and she could tell the truth without the risk of being believed. It was easier than keeping track of lies, and so it became part of who she was: Karou with her wry smile and crazy imagination.” Karou’s self awareness sets her apart – she knows exactly how strange her life is, and yet she enjoys the way she can walk the line between two worlds. This book is, at its core, a fantasy, but the strength and dynamism of the characters is never sacrificed for the intricacies of the plot, and none of the girls we meet are any kind of damsel in distress. Even better – it’s never suggested that they might be. Who would we give it to? Do you know girls who were drawn to to the bigger-than-life romance element of Twilight who deserve a more compelling and credible protagonist? Direct them straight to this book. It’s fantastical, it’s romantic, it has the whole “they shouldn’t be together” element, but the mythology goes so much deeper and the characters are far more richly, complexly realized. These characters, especially Karou, exist in a world far beyond the romance element of the story. Review: First of all, if anyone was concerned that this was another gross attempt to make angels who fall in love with human girls the next big thing, stop worrying immediately. Though seraphim mythology plays a huge role in the way this world is created, this is not, a weirdly Christian angel fantasy. Don’t worry. Instead, this is one of those utterly transporting stories, that convinces the reader so utterly of it’s surroundings that you can look up surprised at the end of a chapter to find yourself on an airplane (or wherever you happen to be reading) instead of a rooftop in Prague or a magic shop with dangerous clientele and doors to any number of cities in the world. Just as much effort has gone into crafting the landscape of the human world as the fantastical worlds we see throughout the story, and the effort shows, giving the entire book a transformative quality. Essentially, the story is, Karou is a 17 year old art student in Prague. She’s a talented, multilingual artist with bright blue hair and tattoos across her body. She fills sketchbooks with images of fantastic creatures that captivate her classmates, but they don’t know that these creatures are not only real, they’re the only family Karou has ever known. But crazy things start to happen in this world, and when disaster strikes, Karou has to go looking for answers to the questions she’s always been forbidden to ask. The fact that Karou is an artist is an integral part of her identity. One of the things that makes this book so good, and sets it above many other fantasy or adventure stories, is that being an artist isn’t some side detail that is used to set the scene and establish our character as interesting that then gets dropped as soon as the action of the story sets in. Karou’s artistry is integral to who she is – it’s part of how we are introduced to her, it defines her friendships and the way she sees and navigates two different worlds, and it impacts the way she reacts and engages with those worlds once life-altering secrets start to be revealed. It’s not ephemeral either – we get long descriptions of her sketchbooks and the large scale installations she creates. They fuel the story and they help us understand who this person is. Karou might be our hero, but she’s for sure not the only Slatebreaker in the book. Her best friend Zuzanna – “bossy in obverse proportion to her size” is also an artist, with a focus in puppetry (which, side note, is really awesome and the description of her human marionette got me really excited). A lot of page time goes into developing this friendship, and it’s this relationship that really gives Karou the strength to move forward once things start to get bad. Akiva, the mysterious angel who is alternately antagonist and romantic partner for Karou is an intriguing character in his own right. Though I’m a bit reluctant to overshare the details of what happens between them, at the risk of spoiling plot points, but I will say that the romance that develops here is complicated and worth following. A couple of big reveals as the plot unfolded honestly surprised me, and definitely made me care about the two of them together. But the real strengths of this story are not even in the characters or the relationships – though they are certainly strong. The most striking thing is really the multiple worlds this wholly original story is grounded in. The overarching mythology that Laini Taylor has created makes for both a compelling read and an intricately created world. I understood the “rules” of the magic in this story early on, and as I learned more about it it enhanced, rather than confusing, my understanding of this framework. And while the ending certainly sets us up for more books, I appreciated the fact that the ending felt like an ending, with some level of emotional resolution and answers to a lot, if not all, of the major questions. And then there’s Prague! This might not have anything to do with the story’s merit, and certainly not it’s feminist components, but oh my god did this book make me wish I could visit Prague. Does anything sound better than buying honey lavender bread fresh from a bakery and eating it on a rooftop looking out at the city’s historic Jewish quarter? Follow it up with watching your friend transform into a human marionette in an epic street performance and having dinner at the Poison Kitchen? I’ve never been to Prague, but just reading this book was enough to make me fall in love with the city from a distance. This entry was posted in Reviews, Young Adult and tagged Angels, Art, Demons, Fantasy, Laini Taylor, Magic. Bookmark the permalink.